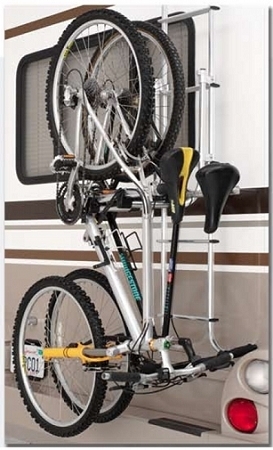 Ladder mounted bike rack. Works with Surco stainless ladders or similar ladders with round tubing. Not for use with Prime Design or Vantech ladders. Mounts without the need for straps or removal to use ladder. Pivoting arms allow easy access to use ladder. Fully assembled - ready to install. Usually ships by the next business day. Ships only by UPS Ground or Canada Standard. Please allow an additional 1-5 business days for delivery to most US locations. Ships only by Ground Service.